Shaped by the same natural elements, sun-baked and weather-worn buildings are backdrops for vibrant displays of seasonal greenery and colorful flowers. 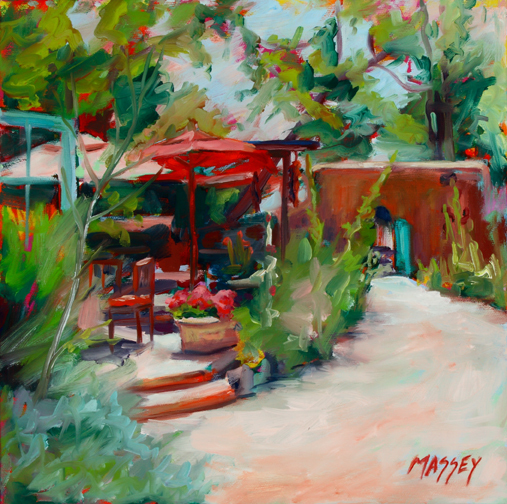 In her paintings of Taos, Marie Massey shifts our focus from the point of destination to the profuse plantings along the way. As pathways and portals beckon, verdant borders thrust themselves onto center stage. In the artist’s adobe gardens, the forces of life hold sway. Drawing from direct observation, Massey enhances her landscapes with intensified colors that brightly contrast. Unrestrained groupings of perennials and native plants are wildly variable. As reds compete with greens, warm tones with cool, leaf-forms collide with flower bursts such that the canvas barely contains the tumult within (The canvases actually have painted edges.). Massey doesn’t paint flowers so much as flowering. This series of paintings can be seen as a play with thresholds. The artist determines a focal point in the distance and invites the viewer in through directional lines, perspective, or an opening in the overgrowth. At times the eye is drawn to an actual doorway or window. Botanical barriers on the verge of their containment cause us to linger, creating intrigue and delight. Saturated colors are pushed to the boundary where descriptive becomes expressive. In September Sunshine, Massey devotes much of the canvas to a crowded area of robust flowers and ornamental trees. The singular Taos-blue window and door capture our attention, and the pinkish crescent of the footpath suggests a means of access. Yet the sunflowers and mallow with their tangled shadows seem to almost lunge out to block passage. The foreground shadow on the lower right melds into the diagonal of tree limbs erupting in the branches of a red-leafed crabapple, which further keeps us from penetrating the space. Here the viewer experiences the pulsating tension between surface and depth. Line and tone engender a sense of recessive space, while brushstrokes and color create formal patterns. The dense garden consists of a wealth of green pigments, which Massey has laid down with varying gestures. Rich bluish and yellowish greens are juxtaposed, which makes each seem to reverberate. Throughout the canvas, the artist allows the underpainting to show through, enhancing the energetic push-pull. Because the gardens appear to overtake the space, there is a sense that nature is about to run riot. Yet what seems as if it has “just happened” is the result of cultivation within the confines of what the environment will allow. Spanish settlers brought hollyhocks with them to Taos, and over the years people have filled up the gaps between adobe structures with feisty plants that can contend with dry soils and erratic watering, brilliant sunlight and cold temperatures, such as poppies, sunflowers, or bearded irises. The collaboration of man and nature is also evident in the adobe structures. Made of earth, sand, and straw, these habitats seem to emerge from the land, echoing the fluid lines of nearby mountains. This centuries-old building material provides cool and warm interiors for the temperature extremes and withstands prolonged exposure to the sun and dry climate. In Massey’s paintings, human activity is continuous with the physical universe, so that the boundary between them disappears. She uses the straight lines of the architecture as grounding for the irregular shapes of the plantlife. By means of the contrast, the viewer feels a sense of movement or growth. 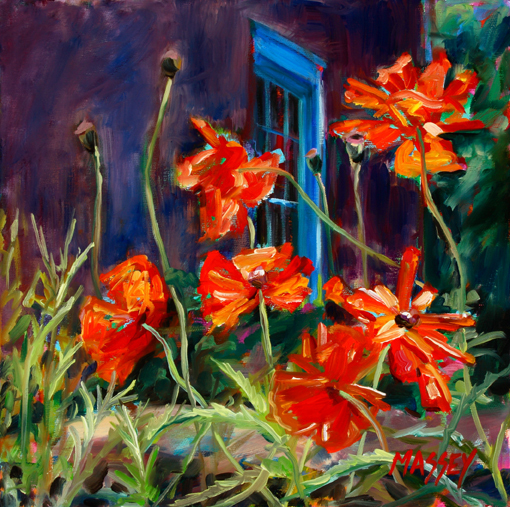 In Tequila Sunrise, Taos, an array of orange-red poppies is vividly set against a blue-purple wall of an adobe structure in shadow. The straight, vertical line of a window acts as a counterfoil to the snaking and jutting lines of the flowerings and their frond-like leaves. The stems would seem barely able to hold the large flowers but for vitality the artist conveys. Living in northern Colorado, Massey embues the landscapes with the exuberance that she experiences in Taos. Responding to the sense of place, she uses a color palette that corresponds to the intensity of the light. Anyone who has visited knows how the setting sun of northern New Mexico can suddenly transform an extraordinary scene into one of almost kaleidoscopic brilliance. Summer Evening, Taos introduces unexpected hues in the foreground flower bed that resonate in the adobe building in the distance. In the bathing light, outlines are softened allowing the distinct shapes of yellow and purple irises to dominate in the center of the canvas. These adobe gardens are not populated by figures. It’s as if the human presence was in the passionate response of the artist. Massey’s spirited working method begins with the overall impression of the scene, in which she gets the main relationships down. Exposing the underpainting, she then combines feathery, suggestive brushstrokes with defining marks to create a lively exchange between texture and form. This play of fluid and fixed, filled and intervals suggests a spontaneity and freshness — as if a painting is still emerging. The very emptiness of such animated spaces begs for someone to enter. In Patio Dining, Taos, the artist appears to have saved the viewer a seat. The lower right portion of the painting is filled by the sweep of a pathway, in which the grounding earth tone is enlivened by both the brushstrokes and blue undertone. Massey establishes a relationship of near and far through the repetition of blue in the open window or door in the left foreground and the open door set in the adobe wall. In contrast with the rest of the canvas, the open area is an accommodating point of entry. Yet the artist has placed a tempting detour along the way. The pathway diverts to a patio with an unoccupied chair. The swath of reddish brown, which defines the steps, catches the viewer’s eye, and this festive color is repeated in the flowers, cushion, and umbrella. The arbored patio is physically an enclosure within an enclosure, and visually Massey further frames the setting with feathering brushstrokes for the shrubs and trees. Applied with panache, these Cezanne-like strokes unite background with foreground, creating a dynamic interplay between the surface of the canvas and the illusion within — between the threshold of the painting itself and the threshold of the door depicted. Favoring the irregular, Massey never lets her compositions settle into the commonplace. Using an impressionistic style, she hints at forms rather than delineates and allows for gaps in and among the representation. This allows the viewer to participate in the “completion” of the painting. The artist stimulates through strong compositional lines and color highlights, which increase the viewer’s eye activity. A motionless scene becomes a heightened sensual experience for those who enter. Taos is a town in which interior flows into exterior, in which a winding street emerges into an open plaza. 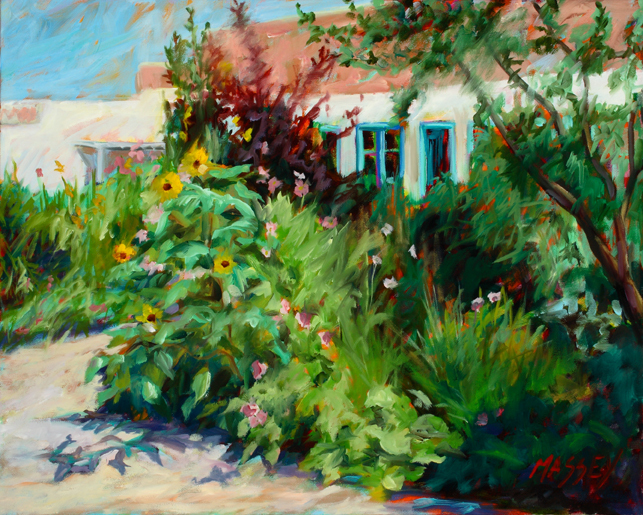 Massey captures this rhythm of quiet and clamor, seclusion and bustle in her paintings of adobe gardens. Just as the garden themselves appear untamed but are tended, so too are her teeming canvases the result of deliberate formal relationships and practiced techniques. With verve and knowing facility, the artist paints visual equivalents of those boldly joyful plantings.